He graduated from the Karaganda Polytechnic Institute in 1971 with a degree in Mining Machines. Specialist in the field of research and creation of hydraulic impulse systems in relation to the working bodies of machines of impact and pulsation action, the development on their basis of new impulse technologies. The topic of the thesis: “Research and creation of working bodies of hydraulic self-moving soil excavators”. Protected in 1979 in RISI (Rostov-on-Don). Subject doctoral dissertation: “Scientific basis for the creation of low-frequency hydraulic pulse systems.” He defended in 1997 in KSTU (Karaganda). Author of more than 200 scientific papers, of which 6 monographs, 8 textbooks, 38 inventions and patents. The main scientific works: “High-performance hydropneumatic percussion machines for laying engineering communications”, Stroy-izdat, Moscow, 1990 (monograph); “Low-frequency hydraulic vibration sources”, Publisher LLP “Arko”. Karaganda, 2001 (monograph); “Low-frequency hydraulic impulse systems (theory, experience of creation)”, publishing house KSTU, 2006 (monograph); “Geophysical studies of coal massif”, publishing house KSTU, 2011 (monograph); “Geophysical studies of coal seams”, publishing house KSTU, 2010 (textbook); “Experience of seismic forecasting of potentially dangerous zones of the coal-bearing massif in the Karaganda coal basin”, collection of scientific works by the Ukrainian Research Institute of Nuclear Science of Ukraine, Donetsk, 2011. 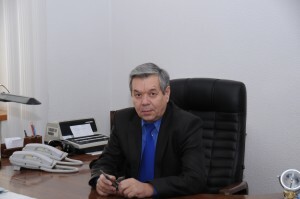 In 2011, he was trained and received a certificate from the International Institute of Welding, is the chairman of the expert group of the National Pension Fund, the chairman of the scientific and technical council of the Karaganda Machine-Building Consortium. Awarded: Diplomas of the Ministry of Education and Science of the Republic of Kazakhstan, MES RK, akim of Karaganda oblast , winner of the International Prize named after Academician A.A. Skochinsky in the field of safe work in coal mines, the owner of the state scientific scholarship “For outstanding contribution to the development of science and technology of the Republic of Kazakhstan” for 2011-2012, was awarded the anniversary medal “20th Anniversary of Independence of Kazakhstan”. He is a participant and winner of the USSR Exhibition of Economic Achievements and Kaz. SSR, VVU of the Russian Federation. He was elected a foreign member of the Russian Academy of Mining Sciences (Decree of the President of the Russian Academy of National Economy on February 22, 2012).